I thought this book might be interesting. It’s not. It’s fascinating. And frustrating. As I read about each woman, I invariably wanted to know more. What inspired Milholland to undertake the enormous task of gathering all these bits of information together? Billie writes, Women in our small Canadian prairie town didn’t have first names. They were Mrs. Adams, Mrs. Day, Baba Yewchin. The day I realized I didn’t know the first names of either of my own grandmothers was the day I began specific research of They Came. The stories are often hilarious and more often harrowing. Edith Vandiver Scoggins and her babies were alone on the homestead when her husband went away to work on a road construction crew. Their cows wandered everywhere because they had no fences. Every evening before Edith went looking for the cows, she tied the baby into a high chair in the yard. She stationed her toddler beside the chair, with strict instruction to sing at the top of her little lungs. The dog sat beside her and howled. As long as Edith could hear the racket, she knew her children were safe. Milholland included a recipe from each of the women. Edith’s daughter remembers her mother’s good thick Potato Soup. I love this bit of Edith’s recipe. Cube potatoes as small as patience will allow, until you have a full pot. European settlement of Western Canada was both rapid and dramatic. People came from all over the world to take advantage of cheap land ($10 for 160 acres/64.7 hectares). Women most often came with parents, or followed husbands and brothers. They traded extended family life in familiar landscapes imbued with ancient histories for life in an undeveloped country with few roads and rough, new communities full of people from diverse cultures, speaking dozens of different languages. We know the stories of men who settled and developed the West, but of the women, except for a handful of rich and famous, we know little. 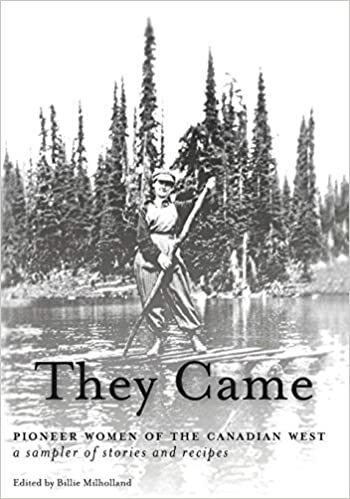 They Came tells the heroic stories of 113 women who came to Western Canada from somewhere else between 1890 and 1950. Following each story is a recipe, something the children and grandchildren remember fondly….